With the clock creeping towards 2 a.m. MST, the Rockies lost in heartbreaking fashion as the Giants scored the winning run on what would have been a force play at the plate had catcher Chris Iannetta’s foot been touching home plate. Ahead are takeaways from the Rockies disheartening loss to the Giants. One of the bright spots of Friday night’s game was the Rockies’ bullpen. Following the departure of starting pitcher Chad Bettis, the Rockies bullpen did an exceptional job of keeping the Giants off the bases, recording 19 consecutive outs before allowing a hit. 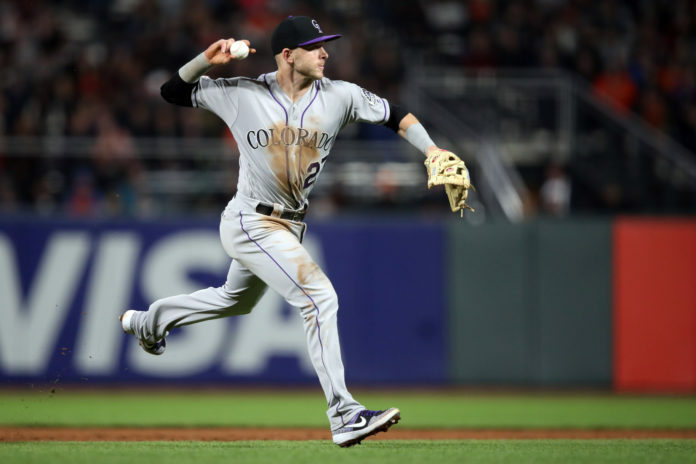 Mike Dunn, Bryan Shaw, Seung-hwan Oh, Scott Oberg, Carlos Estevez, Yency Almonte, Wade Davis, Harrison Musgrave and DJ Johnson all pitched out of the bullpen for Colorado; however, their effort was to no avail as the Rockies offense was unable to validate their effort. The Rockies offense has continued to struggle in 2019 with Friday’s performance possibly being the most frustrating of the season. Colorado had numerous opportunities to establish a lead, and a sizeable one at that, but failed miserably in clutch situations. The Rockies were a putrid 2-for-12 with runners in scoring position and left 11 runners on base. Perhaps the most grueling stretch of play from Colorado’s offense came late in the game and in extra innings. Colorado had runners in scoring position with less than two outs in the eighth, 10th and 11th innings and failed to drive home a run in each instance. Each opportunity ended in either a strikeout or double play for Colorado as their hitting woes continue to ravage the club. Tony Wolters was converted from an infielder to a catcher while in the Rockies’ farm system and his arm was on display Friday night. Wolters gunned down two Giants’ baserunners during the ballgame. The 26-year-old has been sharp behind the plate this season throwing runners out. Runners have converted just four times in the 10 steal attempts that have occured when Wolters was behind the plate. The first throwdown came in the bottom of the second inning where Wolters and Bettis successfully converted a strikeout-throwout double play. Bettis locked Crawford up, setting him down on strikes and Wolters followed by hurling a bullet to second base which beat Brandon Belt by a couple of steps. The second instance came in the bottom of the fifth inning where Wolters gunned down Kevin Pillar who had reached base with a leadoff single. Wolters effort behind the dish helped keep the Rockies within striking distance of the Giants. He also managed to reach base, hitting a single down the third base line in the seventh inning. Through and through, it was a solid game from Wolters. Starting pitcher Chad Bettis bounced back nicely in Friday’s start following two poor outings to start the season. Bettis entered Friday with a 0-2 record and an ERA of 11.88. From the jump, Bettis look strong on the mound, mixing pitches and velocity to keep Giants’ hitters off balance for a majority of the night. Bettis managed to induce a pair of double plays and keep the ball on the ground throughout his start, two things he had been unable to do earlier this season. Bettis pitched a solid five innings, allowing two runs on six hits while striking out four batters. The right-hander was solid for the Rockies and kept the team in the ballgame which is a positive sign considering how lost he looked in his initial two starts. Between Bettis’ start Friday and Jon Gray the day before, the Rockies have received favorable outings from their starters in each of their games against the Giants. The baseball gods showed mercy to the Rockies by gifting them their first lead since their 1-0 win versus the Tampa Bay Rays April 3rd. With Garrett Hampson on third base following a triple, Giants’ starting pitcher Drew Pomeranz committed a balk during an at-bat for Trevor Story. The error pushed Hampson home and established a 1-0 lead for Colorado. While it’s not the most ideal way to score runs, the Rockies will take anything they can get at this point. Though they eventually lost the lead, the gift played a role in pushing the game to extra innings.